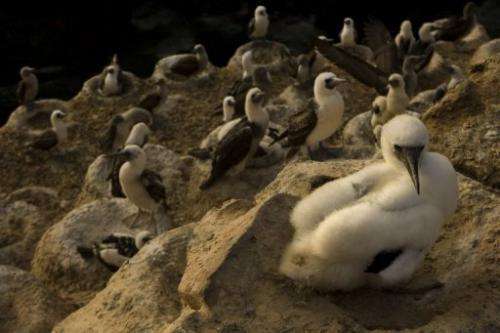 File photo shows a young Peruvian Booby on Macabi island in Peru. A team of ornithologists on Monday were investigating the mysterious death of nearly 600 sea birds found on the beaches of northern Peru, government officials said. A team of ornithologists were investigating the mysterious death of nearly 600 sea birds found on the beaches of northern Peru, government officials said. The investigation follows a probe into the deaths of more than 850 dolphins that have washed ashore since January along the same 170-kilometer (100-mile) stretch of coastline in the northern departments of Piura and Lambayeque. Peru's Oceanic Institute (IMARPE) said that, as of Sunday, they had found 538 dead pelicans and 54 dead Peruvian Boobies. They also found the carcasses of five sea lions that washed ashore and the decomposed remains of a turtle. The Ministry of Production, in charge of fisheries, said in a statement that early results suggest that the birds died on the beach, and did not wash ashore dead. Deputy Environment Minister Gabriel Quijandria said on April 19 that the dolphins were likely killed by a highly infectious virus known as morbillivirus. Experts however are awaiting test results to know whether they can rule out environmental pollution or other factors. "It's not the first time this has happened. There have been other instances in Peru, Mexico and the United States," Quijandria added. Ninety-five percent of the deaths affected bottle-nosed dolphins, officials said.